In the following article, I, Tony, will deal with the supposed errors and supposed blatant contradictions in the Concordant Literal New Testament. Dons points will all be in italic and mine Roman type (non-italic). 1john57.com of KJV Apologetics. All rights reserved. authors note: unless otherwise specified, all verse renderings in this page are quoted from the Concordant Literal New Testament, third printing, Copyright by Concordant Publishing Concern ©1983. All rights reserved. Tonys reply: First of all, Don's premise in writing his thesis is to prove "Concordant Literal New testament error's in translating application of aion and aionios." I am at a loss as to why he brings up all these other side issues rather than his main thesis point which starts his paper. What Don bringing up "Christ rose Himself from the dead" has to do with aion or aionion I haven't a clue. However, let's go down his rabbit trail and see where it leads, shall we? The Companion Bible for exousia says= "authority, or, delegated power; the liberty and right to put forth power, See, e.g., John 1:12." Kittle (TWNT) states for exousia: . . . denotes "ability to perform an action" to the extent that there are no hindrances in the way, as distinct from dunamis in the sense of intrinsic ability" vol.2, p.562. Let us try to think Dons premise through logically. If exousia is translated right according to the CLNT, or power according to the KJV, does either word cause this verse to contradict John 2:19 or 10:29? I would be compelled to say, No. The bible never says that Christ roused or raised Himself from the dead. This One, given up in the specific counsel and foreknowledge of God, you, gibbeting by the hand of the lawless, assassinate, (24) Whom God raises, loosing the pangs of death, forasmuch as it was not possible for Him to be held by it (Act 2:23-24). This Jesus God raises, of Whom we all are witnesses (Act 2:32). To you first, God, raising His Boy . . . (Act 3:26). . . . Jesus Christ, the Nazarene, Whom you crucify, Whom God rouses from among the dead . . . (Act 4:10). We, then, were entombed together with Him through baptism into death, that, even as Christ was roused from among the dead through the glory of the Father . . . (Romans 6:4). Yet the Inaugurator of Life you kill, Whom God rouses from among the dead, of which we are witnesses (Act 3:15). . . . seeing that we testify by God that He rouses Christ, Whom, consequently, He rouses not, if so be that the dead are not being roused (1 Cor.15:15). being aware that He Who rouses the Lord Jesus will be rousing us also . . . (2 Cor.4:14). Therefore the Father is loving Me, seeing that I am laying down My soul that I may be getting it [the soul] again. (18) No one is taking it [the soul] away from Me, but I am laying it [the soul] down of Myself. I have the right to lay it [the soul] down, and I have the right to get it [the soul] again. This precept I got from My Father (John 10:17-18). (Words in brackets [ ] added by me for clarity). The Greek word for power is dunamis. Dunamis is missing in John 10:18. Exousia is present in John 10:18. The KJV often translated exousia as power but also very often translates exousia as authority. And so, authority or right works perfectly in John 10:18. Christ had the right or authority to get His soul again. Christ had the right to lay down His SOUL and the right to get get his SOUL again. Also the object is the soul not the body or the life. Christ had the right to lay down His soul (the KJV translated psuche as life here in John 10:17 rather than soul.) Life in Greek is zoe. Zoe is not in John 10:17. He had the right to get His soul (psuche) again. The soul is the result of the spirit and body coming together. Adams body was made first, then spirit was blown into his body and THEN Adam BECAME a living soul. It is like electricity entering a light bulb and the outcome or combination of these two things coming together is light. Likewise, soul is the result of body and spirit coming together to produce sensations and feelings, i.e., soul. When Christ died and committed His spirit to God and the spirit exited His body, He, in effect, laid down His soul. It became non-functional. When the spirit re-entered Christ's body in the tomb, the result was soul. He, in effect, got His soul again. He had that right or authority to do so. Jesus answered and said to them, Raze this temple, and in three days I will raise it up. (20) The Jews, then, said, In forty and six years was this temple built, and you will be raising it up in three days! (21) Yet He said it concerning the temple of His body. (22) When, then, He was roused from among the dead, His disciples are reminded that He said this, and they believe the scripture and the word which Jesus said (John 2:19-22). Notice it does not say in verse 22: When, then, He roused Himself from among the dead but says when, then, He was roused from among the dead . . . . There is a big difference there. He was roused through (or by means of) the glory of the Father as Romans 6:4 states. So just how are we to take Christs words in three days I will raise it up, since He did not, by His own power raise Himself from the dead? The Scriptures are abundantly clear that it was God that raised Him from the dead. There are only two ways I know of taking this verse. One is that the Father was speaking through Christ. The Father speaking through Christ happened on another occasion in a dialog Jesus had with Philip: Philip is saying to Him, Lord, show us the Father, and it is sufficing us. Jesus is saying to him, So much time I am with you, and you do not know Me, Philip! He who has seen Me has seen the Father, and how are you saying, Show us the Father? (John 14:8-9). It is not that Jesus was saying He (Jesus Himself) was the Father but that the Father was speaking through Him and doing the works through Him. . . . Jesus is saying to her, Do not touch Me, for not as yet have I ascended to My Father. Now go to My brethren, and say to them that I said,  Lo! I am ascending to My Father and your Father, and My God and your God  (John 20:17). 1. The Father was not where Christ was. 2. God was not where Christ was (i.e. in the garden). 3. The Father was above. 5. Christ was ascending to where His God and His Father was. 6. That God and that Father is the disciples God and Father. Therefore we must conclude from Jesus own words that Jesus is not the disciples Father nor the disciples God and that therefore, when Jesus said raze this temple and in three days I will raise it up it must have been the Father speaking through Christ. One other way of looking at this would be that the Father was instrumental in raising Christ up after God roused Him out of the sleep of death. Lets look at these two words a little more in depth. When I go to bed at night the first thing that happens in the morning is that I am roused from sleep. My eyes open. I can remain lying in bed but once I raise myself I am no longer in a supine, horizontal position. I am either sitting on the edge of my bed or standing up. It could be that the God and Father of Christ gave Christ the power to be raised and that it was then that Christ raised Himself from the dead. So either way, Christ could not have been raised unless His God and Father first raised Him. The Sinaticus editor put XY which is the abbreviated form for XPICTOY in the margin standing for Christ in Romans 14:10. So according to the two oldest manuscripts, Alandrinus and Vaticanus, THEOU (God) is in Romans 14:10 for the dais of God whereas the Sinaticus editor has dais of XY. So, in 2 Corinthians 5:10 the dais is called the dais of Christ whereas in Romans 14:10 it is called the dais of God. Knoch had to make a judgment call. He could either go with the Sinaticus editor and use his reading of XY in the margin or use other main manuscripts. He chose the latter. If Knoch is wrong then the oldest manuscripts are wrong. It is possible that since God is not a proper noun, that the writer of Romans 14:10 was referring to Christ as the Subjector which is the basic meaning of THEOS. God does the judging, but He does it through the means of Jesus Christ. For neither is the Father judging anyone, but has given all judging to the Son(John 5:22). The Father is not judging anyone directly but does so through the Son. For all of us must be manifested in front of the dais of Christ, that each should be requited for that which he puts into practice through the body, whether good or bad (2 Cor.5:10). Here all manuscripts agree that this is the dais of Christ. Also, there is no reason why bema cannot be translated as dais rather than judgment seat as the KJV does. The words judgment seat would call for two different Greek words if Knoch were to translate it that way. Bema is a raised platform as is dais. therefore there is no contradiction. Tonys reply: There is nothing in the three oldest manuscripts to warrant adding firstborn in Matthew 1:25. Wescott-Hort Greek New Testament also does not show prototokos or firstborn in its text. Neither do various other translations have firstborn. Also, not having firstborn in Matthew 1:25 does not contradict Luke 2:7 as Don asserts. It is just that Luke 2:7 adds to the information lacking in the Matthew account. Tonys reply: If the Greek word dorean (meaning gratuitously or without a cause) was in Matthew 5:22 in the Vaticanus, Alexandrinus or Sinaticus, Knoch would have put it in the CLNT. In the Greek text of this verse used by the KJV, the word is eike and is translated without a cause and vain/vainly in the KJV. The Concordant Version translates this word feinedly in every passage it appears. What I would like to ask Don is why he thinks he that is angry with his brother, if without a cause is not in Matthew 5:22, contradicts but it is that the word written in their law may be fulfilled, that they hate Me gratuitously (John 15:25). It doesn't contradict 5:22 at all. Neither do all the other verses Don references above contradict 5:22. What I think Don is trying to say is that if without a cause is in all the verses he quoted above, then it should be in Matthew 5:22. But that is incorrect. Without a cause should be in Matthew 5:22 only if dorean is in the Greek texts. It is not in the three oldest Greek manuscripts Knoch used, therefore, according to Knoch, he did not feel warranted in inserting it. Tonys reply: There is nothing sinister going on in the Concordant Version here. John wrote around 96 A.D.: Lo! He is coming with clouds, and every eye shall be seeing Him-those, also, who stab Him-and all the tribes of the land shall be grieving over Him. Yea! Amen! (Rev.1:7). So it doesn't really contradict Zechariah 12:10 as Don would have us believe. It is just that his version is not in line with the Greek texts. Don continues: In Mark 14:21, the CLNT deliberately capitalizes the H in 'Him' which is referring to Jesus Christ. The 'Him' is clearly referring to Judas Iscariot, the 'H' should be lower case. Mark 14:21: ...The Son of Mankind is being given up! Ideal were it for Him if that man were not born! note: Jesus Christ was not referring to Himself in Mark 14:21, the Him should be him which is referring to Judas Iscariot. This contradicts: Luke 22:22 the Son of Mankind is indeed going, according as it has been specified. However, woe to that man through whom He is being given up! and also contradicts: Matthew 18:7 Woe to the world because of snares! For it is a necessity for snares to be coming. Moreover, woe to that man through whom the snare is coming! and this is further confirmed by: 2 Peter 2:20 For if after they have escaped the pollutions of the world through the knowledge of the Lord and Saviour Jesus Christ, they are again entangled therein, and overcome, the latter end is worse with them than the beginning. 2 Peter 2:21 For it had been better for them not to have known the way of righteousness, than, after they have known [it], to turn from the holy commandment delivered unto them. Tonys reply: Don is correct as to this statement given above: the CLNT deliberately capitalizes the H in 'Him' which is referring to Jesus Christ. There is no apology needed for such deliberateness. If this proper rendering causes other verses to be contradicted, according to Don, then there must be either an improper translation of the other verses in question or an improper understanding of the other verses in question. I believe the latter to be the case. Neither Mark 14:21 nor Luke 22:22 contradict each other nor do they contradict Matthew 18:7 nor 2 Peter 2:20,21 as Don suggested. and also 1 Peter 2:24. Where it says that a person who is hanged from a tree is cursed by God. The Apostle Peter is bringing attention to the dire consequences of their rejection of Jesus Christ, showing them that they killed Jesus Christ in the worst way possible, both from a Roman (the cross) and a Jewish (the tree association) point-of-view. Tonys reply: The CLNT translated dendron as tree and xulon as wood and cudgel as a weapon made of wood, stocks made of wood for confining the feet and a log and pole. The KJV translated xulon as staff 5 times, stocks 1 time, tree 10 times and wood 3 times. It translated dendron as tree in every occurrence as does the CLNT. The problem with the KJV is that one would never know if xulon or dendron was being translated unless one had a Greek-English concordance. I'm sure that Christ did not carry a tree (dendron) with branches and leaves to His crucifixion. He carried something made of wood (xulon) to His crucifixion. The CLNT denies (Revelation 21:6 by adding the word 'become', the Greek word for 'become' is ginomai and does not appear in Revelation 21:6) that Jesus Christ is alway's [sic] the Alpha and the Omega. Tonys reply: The above verse should in no way be construed to be understood as contradicting 1 Corinthians 15:24 or 28. First of all, God is giving to John an unveiling of Jesus Christ (Rev.1:1) thus showing a difference between Christ and God. In Revelation 1:6 John is talking about Christ making them a kingdom of priests to His (Christ's) God and Father. The Greek text has: to the God and Father of Him thus showing both God and Father as the possession of Him. So, Christ has a God and a Father. (Note: From Genesis 41:40 thru Revelation 22:3, only king's have a throne. No where in the bible is satan called a king. The CLNT mistranslates 'archon' (throne) in John 12:31 and I can PROVE it using the CLNT by itself. Compare Matthew 12:24 with John 12:31. 'Archon' is used in both verses to denote chief. Beezeboul is the 'chief of the demons' in Matthew 12:24, Mark 3:22, and satan is 'chief' in John 12:31. If satan is a King, then how are there two chiefs? There must be two thrones for satan and beezeboul. That doesn't make any sense. Tonys reply: I'm not sure what version Don is using but the CLNT translates archon as chief in John 12:31 and Matthew 12:24. The only instance in which archee is used of superior earthly powers is found in Luke 12:11, which reads, they may be bringing you before synagogues and chiefs (AV, magistrates) and authorities. Here we see two distinct grades of earthly rule. The synonym archoon is used of the chiefs (AV, rulers) in Israel (Matt.9:18,23; Luke 18:18;23:35; Acts 4:5, etc.) Nicodemus was such a chief (John 3:1). It is also used of the chief (AV, ruler) of the synagogue (Luke 8:41). It will also help us to note that Beezeboul is called the chief (AV, prince) of the demons (Matt.9:34;12:24; Mark 3:22; Luke 11:15), Satan is chief (AV, prince) of the aerial jurisdiction (Eph.2:2), and Christ is Chief or Suzerain of the kings of the earth (Rev.1:5). Such superior positions on earth are called chief in order to help us to apprehend what is meant when the Scriptures mention the celestial sovereignties. Usually, indeed, the earthly and heavenly dignitaries are both included in the term, as in Romans 8:38; 1 Corinthians 15:24; Ephesians 1:21; Colossians 1:16; 2:10,15. No sovereignties, no chiefs, captains, or princes, with all their might, whether on earth or in heaven, will be able to separate us from the love of God which is in Christ Jesus our Lord (Rom.8:38). All of these are connected with rule, and all will be gone when rule retires (1 Cor.15:24). Christ has ascended above all such, not only on earth, but in the heavens (Eph.1:21). The whole universe, in heaven and on earth, was created in the Son of God's love, whether thrones or dominions or sovereignties (Colossians 1:16) (A.E. Knoch, Unsearchable Riches, vol.25 p.154). Don wrote: Another illustration: John 3:1 ...Nicodemus his name, a chief of the Jews. How can a chief be a King in John 3:1? There can be many chiefs, but there is only one King. Scripture is consistent with this....even in the CLNT, however, the CLNT's translational inconsistencies shine great in Revelation 2:13. John 12:31 Now is the judging of this world. Now shall the Chief of this world be cast out. Tonys reply: Why must, according to Don, Nicodemus be a king if he has the title chief? Why must a chief be a king? Who said that only kings sit on thrones? Who said a chief cannot sit on a throne or a place of authority? Obviously, since Satan has a throne but carries the title chief, this proves that chiefs do indeed sit on thrones. In Revelation 4:4 the twenty-four elders each have a throne. The King James version translated thronos here as seats. In the Greek it is: And around the THRONOU (throne-singular) twenty four THRONOUS (thrones-plural) and on the THRONOUS (thrones-plural) I saw 24 elders sitting. They are not called Kings nor chiefs yet they have thrones. They each have positions of authority. Christ, in Luke 22:30 told his twelve disciples that they would each have a throne (the KJV says as much also) and yet, are they ever called kings? In Revelation 2:13 thronos is in the Greek and so is translated throne in every instance where it occurs. Seat on the other hand is kathedra in Greek. Someone reading the KJV would not know which Greek word was used but they would if reading the CLNT. What is also interesting is that quite a few other Bibles translate thronos as throne in Revelation 2:13. Not that that makes it right, but I do find it interesting that Don does not go after those other translations. I and the Father, We are one. Again, then, the Jews bear stones that they should be stoning Him. Jesus answered them, Many ideal acts I show you from My Father. Because of what act of them are you stoning Me? The Jews answered Him, For an ideal act we are not stoning you, but for blasphemy, and that you, being a man, are making yourself God. Jesus answered them, Is it not written in your law, that 'I say you are gods'? If He said those were gods, to whom the word of God came (and the scripture can not be annulled), (John 10:30-35). Was Moses, now considered to be the Supreme Deity of the universe once God had conferred upon him the title God? Now I hope Don or those of his persuasion will not say that we believe we all become gods or God. It also begs the question: What exactly did Jesus mean by I and the Father, We are one? Let us look at John 17:22 for the answer: And I have given them the glory which Thou has given Me, that they may be one, according as We are One. Are the twelve apostles now a part of the blessed holy Trinity? Are they now God? If according to Don, oneness with God means one becomes the Supreme Deity of the universe then are we to understand that the 12 become twelve separate supreme Deities of the universe? Are they now equal to GOD? Or do they all get absorbed into God? I doubt it. He that believeth 4100 on 1519 the 588 Son 5207 hath 2192 everlasting 166 life: 2222 and 1161 he that believeth 544 not the 3588 Son 207 shall not 3756 see 3700 life; 2222 but 235 the 3588 wrath 3709 of God 316 abideth 3306 on 1909 him 846 (John 3:36). Tonys reply: We are thankful for such close scrutiny of the CLNT. Don is correct. There is a capitalized Son in Matthew 4:3 and 4:6 but not in Luke 4:3 and 4:9. This will probably be fixed in the next printing. It is just a typographical error. Tonys reply: Don is correct. Cakes is not in the Greek text. That is why we put it in lightface in the CLNT. In the Holy Land the common thing to do with dough was to make ember cakes of bread. The King James version does the same thing with words it adds which are not in the Greek text but puts them in italic instead of lightface. It is nothing sinister on our or the KJV's part. Tonys reply: Already dealt with above. It is just a typographical error. Don wrote: Ephesians 4:13 unto the end that we should all attain to the unity of the faith and of the realization of the son of God, to a mature man, to the measure of the stature of the complement of Christ,(note: the s in 'son' is not capitalized. Compare with Matthew 4:3 & 4:6,). Don wrote: John 5:27 And He gives Him authority to do judging, seeing that He is a son of mankind. (note: the s in 'son' is not capitalized. Compare with Matthew 4:3 & 4:6). Tonys reply: Interesting. It is just a typographical error. Don wrote: (note: The CLNT contradicts itself in 73 other verses in the New Testament. 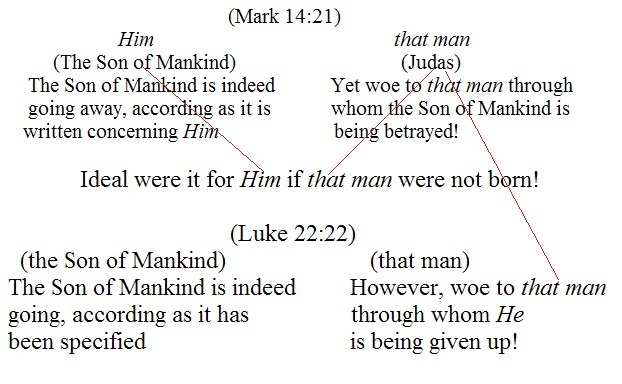 The s in 'son' is not capitalized and this contradicts numerous other renderings of the Son of Mankind in the CLNT: Blatant deceitful attack on the deity of Jesus Christ by adding a. There is only one Son of Man: Jesus Christ). Tonys reply: John 5:29 supports Daniel 12:2. It does not contradict 2 Peter 2:9 or 3:7 or 1 John 4:17. There is more than one resurrection and more than one judging. When Christ comes for the believers of the body of Christ, we are resurrected before the son of lawlessness is revealed. As far as I know, the Jewish believers are resurrected after that. Daniel writes of this resurrection: Dan 12:2 From those sleeping in the soil of the ground many shall awake, these to eonian life and these to reproach for eonian repulsion. Notice it does not say that all mankind shall awake. Those who commit lawlessness will be judged as not worthy of the kingdom and cast out of the 1000 year kingdom. Then at the end of the 1000 years there will be the resurrection and judging of all mankind before the great white throne. We believers are resurrected at least 1000 years before the rest of all mankind are at the great white throne. So it is incorrect to suggest as Don does that there is only one resurrection. Tonys reply: In the Concordant Greek Text, the sublinear has: CONSEQUENTLY THE BELIEF OUT OF-HEARing (Grk. AKOHC, THE YET HEARing (Grk. AKOH) THROUGH declaration OF-ANOINTED. So Don does have a case for faith cometh by hearing and hearing . . . . Yet, in the verse just preceding this one in Romans 10:16 the KJV has translated AKOH report! So why does not Don castigate his own beloved KJV on this matter? Also, this is not concerning how many Word's of God there are. It is talking about when an evangelist gives out the tidings (report, KJV) concerning Christ that it is through that means that faith comes. In the CLNT logos is translated word and rhema is translated declaration. In the KJV rhema is translated saying 9 times, thing 3 times and word 56 times. The KJV translated logos as account 8 times, cause 1 time, communication 3 times, do 1 time, doctrine 1 time, fame 1 time, intent 1 time, matter 4 times, mouth 1 time, preaching 1 time, question 1 time, reason 2 times, rumor 1 time, saying 50 times, shew 1 time, speech 8 times, talk 1 time, thing 4 times, things to say 1 time, tidings 1 time, treatise 1 time, utterance 4 times, word 208 times, Word 7 times, words 4 times, work 2 times. Now I ask you, how can anyone know what logos or rhema mean using the King James Version? Also, should this be a declaration of Christ or of God? Alexandrinus has THEOU which is Greek for God. The editor of the Sinaticus manuscript put THEOU in the margin as a correction but the Sinaticus and Vaticanus both have Christou in the text which is Christ. So the CLNT went with that information. Here, in the KJV, the righteousness of God is by the faith of Jesus Christ unto all that believe. Even the KJV acknowledges that Jesus Christ had faith and it is by His faith that God's righteousness comes to us. There is the relative and the absolute. Absolutely, God's righteousness comes to humanity through the faith of Jesus Christ. In the relative sense, we do have faith that God is right and truthful when it is stated that Christ died for our sins. But even that faith which we have is gratuitously or freely given by God and did not originate in us. There was a time when we who have faith now had no faith at all. Tonys reply: Don misquoted Romans 3:26 in the CLNT. It should be: toward the display of His righteousness in the current era, for Him to be just and a Justifier of the one who is of the faith of Jesus. God's righteousness is displayed in the current era. Just because it is said to be displayed in the current era does not mean it will not be displayed in subsequent eras to come. God is the God of Abraham, Isaac and Jacob. Does this mean He is not our God too? Of course not. Tonys reply: Being, then, justified by faith, we may be having peace toward God, through our Lord, Jesus Christ, (2) through Whom we have the access also (Rom 5:1). It is not a matter of who else is there? The point is that we have peace toward God through Jesus and it is also through Jesus we have the access. Tonys reply: In the Greek text it is: through the faith of Him. Faith of Him can also be properly translated His faith just as Son of God can be translated God's Son. Therefore His faith is perfectly fine and in harmony with the Greek text. The verse is not about righteousness is only through faith in Jesus Christ as Don suggests. The verse is concerning having access to God with confidence after one is saved and after one already has the righteousness of God. It is concerning prayer and coming to God therein. Don wrote: Mark 1:2 As it is written in Isaiah the prophet...(note: written in Malachi 3:1, not Isaiah). Concerning Mark 1:2: As it is written in the prophets - Rather, As it is written by Isaiah the prophet. I think this reading should be adopted, instead of that in the common text. It is the reading of the Codex Bezae, Vatican, and several other MSS. of great repute. It is found also in the Syriac, Persic, Coptic, Armenian, Gothic, Vulgate, and Itala versions, and in several of the fathers. As this prophecy is found both in Isaiah and Malachi, probably the reading was changed to tois prophetais, the prophets, that it might comprehend both. In one of Asseman�s Syriac copies, both Isaiah and Malachi are mentioned. See all the authorities in Griesbach, 2d edit. ; and see the parallel place in Matthew 3:3: (For this is he of whom it is declared through Isaiah the prophet, saying, The voice of one imploring: 'In the wilderness make ready the road of the Lord! Straight...be making the highways'of Him! ), where the Prophet Isaiah is mentioned, which seems fully to establish the authority of this reading (Adam Clarke's Commentary on the Bible). The verse is found in Isaiah 40:3. Tonys reply: Interesting that the KJV has it basically the same way thus: Luke 4:8 And Jesus answered and said unto him, Get thee behind me, Satan: for it is written, Thou shalt worship the Lord thy God, and him only shalt thou serve. So I guess I can ask the same stupid question: Satan can serve God? It is not about what Satan can or cannot do. It is concerning what was actually written in the law which Christ was quoting. As God always was, there is no absolute beginning brought before us in the Scriptures. Both here and in Genesis 1:1 the article the is lacking in the originals, showing that it refers to the commencement of the subject in hand. In Genesis it is the beginning of creation. Here it is the beginning of revelation. The phrase might be rendered idiomatically, To begin with. The Logos, or Saying, or Expression, or Word, brings before us the revelation of God through sound, which appeals to the ears of His creatures. It is inferior to and in contrast with the revelation in which Christ is presented to sight, as the Image of God. Paul was saved by a sight of His transcendent glory. John was called by His word. Sound is slow and confined to the earth. Sight is swift and searches the heavens. This suggests the limited sphere of John's ministry. With suggests two Greek words neither of which is used here. hence for accuracy's sake it is best to translate literally toward. With God has no cogency in this connection. Toward indicates that the revealed Word pointed the creature in the direction of God. Take every thus saith the Lord in the Hebrew Scriptures and they all point us to God, and reveal some attribute of the divine character. Tonys reply: Yes, bloods. Bloods is plural in the Greek text and so this is shown in the CLNT. In Matthew 16:17, 23:30,35 Don references above, blood is not plural. There is no contradiction. Concerning this verse, A.E. Knoch wrote: He is God's Image and His Expression. Often is God spoken of as the God and Father of our Lord, Jesus Christ. Yet the title God is not denied the Son. Thomas acknowledges Him to be his Lord and his God, and is not rebuked for his confession (John 20:28). There is a strong probability that He is called the Only Begotten God in the first chapter of John's gospel (v.18). The same apostle tells us that He is the true God (1 John 5:20). The apostle Paul characterizes Him as God over all, blessed for the eons (Rom.9:5). Indeed, while the title Father is the one most distinct from the Son, He is the Impress of the Divine Fatherhood, too. He told His disciples `If ye had known Me, ye should have known My Father also. And from henceforth ye know Him and have seen Him.' Philip saith unto Him, `Lord, show us the Father, and it sufficeth us.' Jesus saith unto him, `Have I been so long time with you, and yet hast thou not known Me, Philip? He that hath seen Me hath seen the Father; and how sayest thou `Show us the Father?' Believest thou not that I am in the Father and the Father is in Me? The words that I speak unto you I speak not from Myself. But the Father that abideth in Me, He doeth the works. Believe Me that I am in the Father and the Father in Me' (John 14:7-11). From all of these examples it is evidently beside the mark to seek to limit any divine characterization to Deity, for we cannot hear Him apart from His Expression, we cannot see Him apart from His Image, we cannot perceive the characters He assumes apart from the Impress of His assumptions. This does not obliterate manifest differences of identity and personality. Indeed, we are forced to distinguish between the Image and its invisible Original, we cannot confuse the Expression with the One Who speaks, and we are not distressed when the Impress is spoken of in the same terms as the Assumption. The one great Mediator between God and humanity is fully authorized to speak and act as God; and to receive the honors which are due to Him only. And this because His will and ways and words are not His own but His Who sent Him. To continue reading my response to more of Don Hewey on the Concordant Literal New Testament please go here to Part II.